On April 19th Vera Bradley is going to have a special shopping day. I just got my postcard in the mail for the day! It says enjoy special offers, sweet summertime treats and in-store giveaways throughout the day. 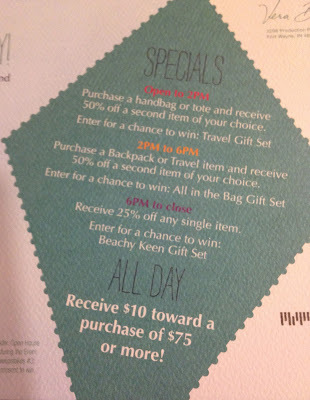 All DayReceive $10 towards a purchase of $75 or more. Grand PrizeOne $250 VEra Bradley Gift Card for you, plus four $20 Gift Cards for your friends! There is also a VIP party on the 18th that some of you might receive an invitation to! I have had my eye on Clare...this might be the perfect time to go buy one!